Diana, Princess of Wales (Diana Frances; née Spencer; 1 July 1961 - 31 August 1997) was the first wife of Charles, Prince of Wales, whom she married on 29 July 1981. She was also well known for her fund-raising work for international charities, and an eminent celebrity of the late 20th century. Her wedding to Charles, heir to the British throne and those of the 16 Commonwealth realms, was held at St Paul's Cathedral and seen by a global television audience of over 750 million. While married she bore the courtesy titles Princess of Wales, Duchess of Cornwall, Duchess of Rothesay, Countess of Chester and Baroness of Renfrew. The marriage produced two sons, the princes William and Harry, currently second and third in line to the throne, respectively. Diana was born into an aristocratic English family with royal ancestry and became a public figure with the announcement of her engagement to Prince Charles. Diana also received recognition for her charity work and for her support of the International Campaign to Ban Landmines. From 1989, she was the president of Great Ormond Street Hospital for Children, in addition to dozens of other charities. She remained the object of worldwide media scrutiny during and after her marriage, which ended in divorce on 28 August 1996. Media attention and public mourning were great after her death in a car crash in Paris on 31 August 1997. 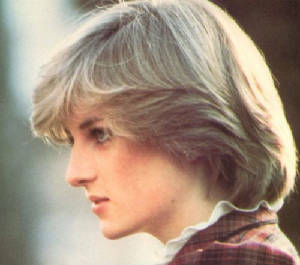 Diana was born in the late afternoon on July 1, 1961, in Sandringham, Norfolk. 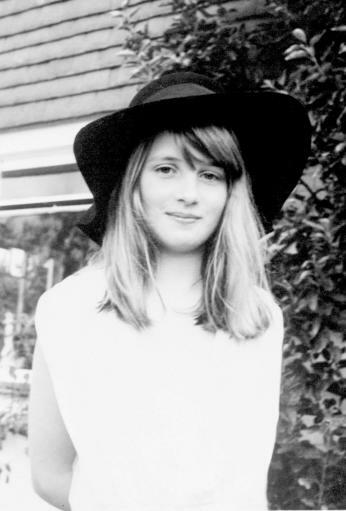 She was the fourth of five children of the Viscount and Viscountess Althorp (née Frances Roche, later Shand Kydd). The Spencer family was hoping for a male heir to carry on the Spencer title (their third child, a boy, died soon after birth). The Spencer family is one of Great Britain's oldest and most important families, closely allied with the royal family for several generations. As the family was expecting a boy, no name was chosen for a week, until they settled on Diana Frances, after a Spencer ancestress and her mother. Diana has three siblings: Sarah, Jane, and Charles; and was baptised at Sandringham church; her younger brother, Charles, was baptised at Westminster Abbey with Elizabeth II as principal godparent. 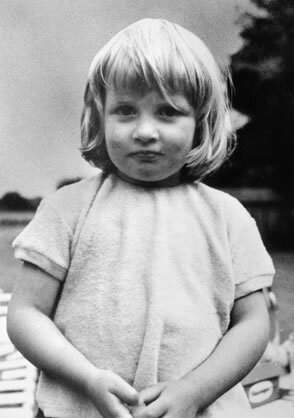 Diana also had an infant brother, John, who died a year before she was born. According to Andrew Morton's biography of Diana, the infant John Spencer was so deformed and sick he only survived 10 hours after his birth.The desire for an heir added strain to the Spencers' marriage, and Lady Althorp was reportedly sent to Harley Street clinics in London to determine the cause of the "problem". The experience was described as "humiliating" by Charles Spencer, the current earl: "It was a dreadful time for my parents and probably the root of their divorce because I don't think they ever got over it." Diana grew up in Park House, which was situated near to the Sandringham estate. 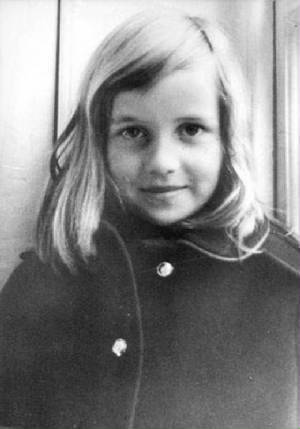 Diana was only seven years old when her parents were separated. Her estranged mother, Frances, had an affair with Peter Shand Kydd. In Morton's book, he describes Diana's remembrance of Lord Althorp loading suitcases in the car and Frances crunching across the gravel forecourt and driving away through the gates of Park House. 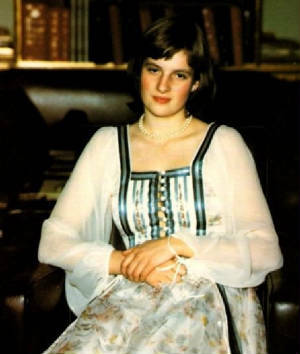 Diana lived with Frances in London during her parents' separation, but during the Christmas holidays by the end of the year, Lord Althorp refused to let Frances to return with Diana to London. Shortly afterwards, Lord Althorp eventually won custody of Diana with support from his mother-in-law, Ruth Roche, Baroness Fermoy. Diana was first educated at Riddlesworth Hall near Diss, Norfolk, and later attended boarding school at The New School at West Heath,in Sevenoaks, Kent. In 1973, Lord Althorp began a relationship with Raine, Countess of Dartmouth, the only daughter of Alexander McCorquodale and Barbara Cartland. Diana received the title of Lady after her father inherited the title of Earl Spencer on 9 June 1975. Lord Spencer and Lady Dartmouth were married at Caxton Hall, London on 14 July 1976. As Countess Spencer, Raine was unpopular with Diana. Diana was often noted for her shyness while growing up, but she did take an interest in both music and dancing. She also had a great interest in children. After attending finishing school at the Institut Alpin Videmanette in Switzerland, she moved to London. She began working with children, eventually becoming a nursery teacher at the Young England School. Diana had apparently played with Princes Andrew and Edward as a child while her family rented Park House, a property owned by Elizabeth II and situated on the Sandringham Estate. In 1968, Diana was sent to Riddlesworth Hall, an all-girls boarding school. While she was young, she attended a local public school. She did not shine academically, and was moved to West Heath Girls' School (later reorganised as The New School at West Heath) in Sevenoaks, Kent, where she was regarded as a poor student, having attempted and failed all of her O-levels twice. However, she showed a particular talent for music as an accomplished pianist. Her outstanding community spirit was recognised with an award from West Heath. In 1977, she left West Heath and briefly attended Institut Alpin Videmanette, a finishing school in Rougemont, Switzerland. At about that time, she first met her future husband, who was then in a relationship with her older sister, Sarah. Diana also excelled in swimming and diving, and longed to be a professional ballerina with the Royal Ballet. She studied ballet for a time, but then grew too tall for the profession. Diana moved to London in 1978, living in her mother's flat, as her mother then spent most of the year in Scotland. 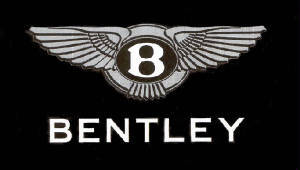 Soon afterwards, an apartment was purchased for £50,000 as an 18th birthday present, at Coleherne Court in Earls Court. She lived there until 1981 with three flatmates. In London, she took an advanced cooking course at her mother's suggestion, although she never became an adroit cook, and worked as a dance instructor for youth, until a skiing accident caused her to miss three months of work. She then found employment as a playgroup (pre-preschool) assistant, did some cleaning work for her sister Sarah and several of her friends, and worked as a hostess at parties. 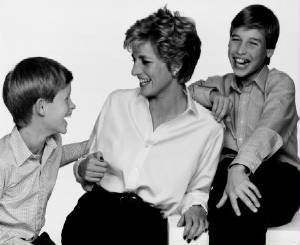 Diana also spent time working as a nanny for an American family living in London. The Prince of Wales (Prince Charles) had previously been linked to Lady Diana's elder sister Lady Sarah, and in his early thirties he was under increasing pressure to marry. The Prince of Wales had known Lady Diana for several years, but he first took a serious interest in her as a potential bride during the summer of 1980, when they were guests at a country weekend, where she watched him play polo. The relationship developed as he invited her for a sailing weekend to Cowes aboard the royal yacht Britannia, followed by an invitation to Balmoral (the Royal Family's Scottish residence) to meet his family. Lady Diana was well received by Elizabeth II, by The Duke of Edinburgh, and by Queen Elizabeth The Queen Mother. The couple subsequently courted in London. The prince proposed on 6 February 1981, and Lady Diana accepted, but their engagement was kept secret for the next few weeks. Their engagement became official on 24 February 1981, after Lady Diana selected a large £30,000 ring (£94,800 in today's terms) consisting of 14 diamonds surrounding a sapphire, similar to her mother's engagement ring. The ring was made by the then Crown jewellers Garrard but, unusual for a member of the Royal Family, the ring was not unique and was, at the time, featured in Garrard's jewellery collection. The ring later became, in 2010, the engagement ring of Catherine Middleton (now The Duchess of Cambridge, wife of Diana's elder son Prince William). Twenty-year-old Diana became The Princess of Wales when she married The Prince of Wales on 29 July 1981 at St Paul's Cathedral, which offered more seating than Westminster Abbey, generally used for royal nuptials. It was widely billed as a "fairytale wedding", watched by a global television audience of 750 million while 600,000 people lined the streets to catch a glimpse of Diana en route to the ceremony. At the altar Diana accidentally reversed the order of Charles's first two names, saying "Philip Charles" Arthur George instead. She did not say that she would "obey" him; that traditional vow was left out at the couple's request, which caused some comment at the time. 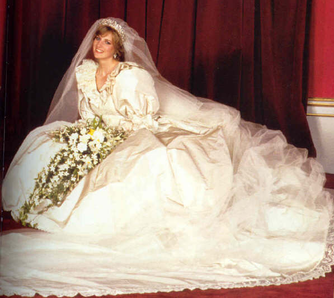 Diana wore a dress valued at £9000 with a 25-foot (8-metre) train. On 5 November 1981, the Princess' first pregnancy was officially announced, and she frankly discussed her pregnancy with members of the press corps. After Diana fell down a staircase at Sandringham in January 1982, 12 weeks into her first pregnancy, the royal gynaecologist Sir George Pinker was summoned from London. He found that although she had suffered severe bruising, the foetus was uninjured. In the private Lindo Wing of St Mary's Hospital in Paddington, London on 21 June 1982, under the care of Pinker, the Princess gave natural birth to her and the Prince's first son and heir, William Arthur Philip Louis. Amidst some media criticism, she decided to take William, still a baby, on her first major tours of Australia and New Zealand, but the decision was popularly applauded. By her own admission, the Princess of Wales had not initially intended to take William until it was suggested by Malcolm Fraser, the Australian prime minister. A second son, Henry Charles Albert David, was born two years after William, on 15 September 1984. The Princess asserted she and the Prince were closest during her pregnancy with "Harry" (as the younger prince has always been known). She was aware their second child was a boy, but did not share the knowledge with anyone else, including the Prince of Wales. Even her harshest critics agree that the Princess of Wales was a devoted, imaginative and demonstrative mother. She rarely deferred to the Prince or to the Royal Family, and was often intransigent when it came to the children. She chose their first given names, dismissed a royal family nanny and engaged one of her own choosing, selected their schools and clothing, planned their outings and took them to school herself as often as her schedule permitted. She also negotiated her public duties around their timetables. Although in 1983 she confided in the then-Premier of Newfoundland, Brian Peckford, "I am finding it very difficult to cope with the pressures of being Princess of Wales, but I am learning to cope," from the mid-1980s, the Princess of Wales became increasingly associated with numerous charities. As Princess of Wales she was expected to regularly make public appearances to hospitals, schools and other facilities, in the 20th century model of royal patronage. The Princess developed an intense interest in serious illnesses and health-related matters outside the purview of traditional royal involvement, including AIDS and leprosy. In addition, she was the patroness of charities and organisations working with the homeless, youth, drug addicts and the elderly. From 1989, she was President of Great Ormond Street Hospital for Children. The day after her divorce, she announced her resignation from over 100 charities to spend more time with the remaining six. During her final year Diana lent highly visible support to the International Campaign to Ban Landmines, a campaign which won the Nobel Peace Prize in 1997, only a few months after her death. The Princess of Wales was interviewed for the BBC current affairs show Panorama by journalist Martin Bashir; the interview was broadcast on 20 November 1995. In it, the Princess said of her relationship with Hewitt, "Yes, I adored him." Of Camilla, she claimed "There were three of us in this marriage." For herself, she said, "I'd like to be a queen of people's hearts." On the Prince of Wales' suitability for kingship, she said, "Because I know the character I would think that the top job, as I call it, would bring enormous limitations to him, and I don't know whether he could adapt to that." In December 1995, the Queen asked the Prince and Princess of Wales for "an early divorce", as a direct result of the Princess' Panorama interview. This followed shortly after the Princess' accusation that Tiggy Legge-Bourke had aborted the Prince's child, after which Legge-Bourke instructed Peter Carter-Ruck to demand an apology. Two days before this story broke, Diana's secretary Patrick Jephson resigned, later writing that the Princess had "exulted in accusing Legge-Bourke of having had an abortion". On 20 December 1995, Buckingham Palace publicly announced the Queen had sent letters to the Prince and Princess of Wales advising them to divorce. The Queen's move was backed by the Prime Minister and by senior Privy Counsellors, and, according to the BBC, was decided after two weeks of talks. The Prince immediately agreed with the suggestion. In February, the Princess announced her agreement after negotiations with the Prince and representatives of the Queen, irritating Buckingham Palace by issuing her own announcement of a divorce agreement and its terms. The divorce was finalised on 28 August 1996. Diana received a lump sum settlement of around £17 million along with a clause standard in royal divorces preventing her from discussing the details. Days before the decree absolute of divorce, Letters Patent were issued with general rules to regulate royal titles after divorce. In accordance, as she was no longer married to the Prince of Wales, Diana lost the style Her Royal Highness and instead was styled Diana, Princess of Wales. Buckingham Palace issued a press release on the day of the decree absolute of divorce was issued, announcing Diana's change of title, but made it clear Diana continued to be a British princess. Buckingham Palace stated Diana was still a member of the Royal Family, as she was the mother of the second- and third-in-line to the throne. This was confirmed by the Deputy Coroner of the Queen's Household, Baroness Butler-Sloss, after a pre-hearing on 8 January 2007: "I am satisfied that at her death, Diana, Princess of Wales continued to be considered as a member of the Royal Household." This appears to have been confirmed in the High Court judicial review matter of Al Fayed & Ors v Butler-Sloss. In that case, three High Court judges accepted submissions that the "very name ‘Coroner to the Queen's Household' gave the appearance of partiality in the context of inquests into the deaths of two people, one of whom was a member of the Family and the other was not." After the divorce, Diana retained her double apartment on the north side of Kensington Palace, which she had shared with the Prince of Wales since the first year of their marriage, and it remained her home until her death. Prince William comforted her, and he was said to have wanted to let her have the style of Her Royal Highness again. He was reported to have said: "Don't worry, Mummy, I will give it back to you one day when I am King." Diana dated the respected heart surgeon Hasnat Khan, from Jhelum, Pakistan, who was called "the love of her life" after her death by many of her closest friends, for almost two years, before Khan ended the relationship. Khan was intensely private and the relationship was conducted in secrecy, with Diana lying to members of the press who questioned her about it. Khan was from a traditional Pakistani family who expected him to marry from a related Muslim clan, and their differences, which were not just religious, became too much for Khan. According to Khan's testimonial at the inquest for her death, it was Diana herself, not Khan, who ended their relationship in a late-night meeting in Hyde Park, which adjoins the grounds of Kensington Palace, in June 1997. Within a month Diana had begun seeing Dodi Fayed, son of her host that summer, Mohamed Al-Fayed. Diana had considered taking her sons that summer on a holiday to the Hamptons on Long Island, New York, but security officials had prevented it. After deciding against a trip to Thailand, she accepted Fayed's invitation to join his family in the south of France, where his compound and large security detail would not cause concern to the Royal Protection squad. Mohamed Al-Fayed bought a multi-million pound yacht, the Jonikal, a 60-metre yacht on which to entertain Diana and her sons. 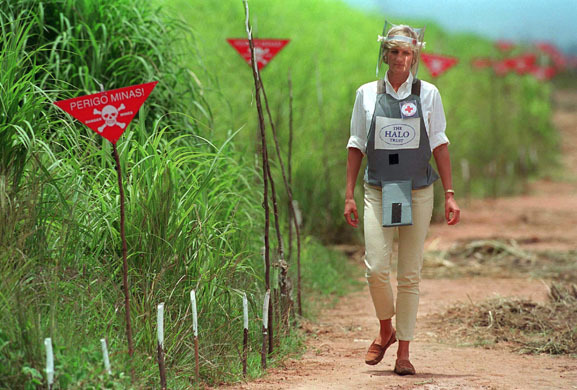 In January 1997, pictures of Diana touring an Angolan minefield in a ballistic helmet and flak jacket were seen worldwide. It was during this campaign that some accused her of meddling in politics and declared her a 'loose cannon'. In August 1997, just days before her death, she visited Bosnia with Jerry White and Ken Rutherford of the Landmine Survivors Network. Her interest in landmines was focused on the injuries they create, often to children, long after a conflict is over. The United Nations appealed to the nations which produced and stockpiled the largest numbers of landmines (United States, China, India, North Korea, Pakistan, and Russia) to sign the Ottawa Treaty forbidding their production and use, for which Diana had campaigned. Carol Bellamy, Executive Director of the United Nations Children's Fund (UNICEF), said that landmines remained "a deadly attraction for children, whose innate curiosity and need for play often lure them directly into harm's way". On 31 August 1997, Diana was fatally injured in a car crash in the Pont de l'Alma road tunnel in Paris, which also caused the deaths of her companion, Dodi Fayed and the driver, Henri Paul, acting security manager of the Hôtel Ritz Paris. Millions of people watched her funeral. The initial French judicial investigation concluded the accident was caused by Henri Paul's drunken loss of control. As early as February 1998, Dodi's father, Mohamed Al-Fayed (who was also the owner of the Paris Ritz, for which Paul had worked) publicly maintained that the crash had been planned, accusing MI6 as well as The Duke of Edinburgh. An inquest in London starting in 2004 and continued in 2007-2008 attributed the accident to grossly negligent driving by Henri Paul and to the pursuing paparazzi. On 8 April 2008, the day following the final verdict of the inquest, Al-Fayed announced he would end his 10-year campaign to establish that it was murder rather than an accident, stating that he did so for the sake of the late princess's children. The sudden and unexpected death of an extraordinarily popular royal figure brought statements from senior figures worldwide and many tributes by members of the public. People left public offerings of flowers, candles, cards and personal messages outside Kensington Palace for many months. Diana's funeral took place in Westminster Abbey on 6 September 1997. The previous day Queen Elizabeth II had paid tribute to her in a live television broadcast. Her sons, the Princes William and Harry, walked in the funeral procession behind her coffin, along with the Prince of Wales and the Duke of Edinburgh, and with Diana's brother, Charles Spencer, 9th Earl Spencer. Lord Spencer said of his sister, "She proved in the last year that she needed no royal title to continue to generate her particular brand of magic." The Diana, Princess of Wales Memorial Walk, a circular path between Kensington Gardens, Green Park, Hyde Park and St James's Park, London. In addition, there are two memorials inside Harrods department store, at the time owned by Dodi Fayed's father Mohamed Al-Fayed, in London. The first memorial consists of photos of the two behind a pyramid-shaped display that holds a wine glass still smudged with lipstick from Diana's last dinner as well as an 'engagement' ring Dodi purchased the day before they died. The second, unveiled in 2005 and titled "Innocent Victims", is a bronze statue of the two dancing on a beach beneath the wings of an albatross. The Flame of Liberty, erected in 1989 on the Place de l'Alma in Paris, above the entrance to the tunnel in which the fatal crash later occurred, has become an unofficial memorial to Diana. Following Diana's death, the Diana Memorial Fund was granted intellectual property rights over her image. In 1998, after refusing the Franklin Mint an official license to produce Diana merchandise, the fund sued the company, accusing it of illegally selling Diana dolls, plates and jewellery. In California, where the initial case was tried, a suit to preserve the right of publicity may be filed on behalf of a dead person, but only if that person is a Californian. The Memorial Fund therefore filed the lawsuit on behalf of the estate and, upon losing the case, were required to pay the Franklin Mint's legal costs of £3 million which, combined with other fees, caused the Memorial Fund to freeze their grants to charities. In 1998, Azermarka issued postage stamps with both Azeri and English captions, commemorating Diana. The English text reads "Diana, Princess of Wales. The Princess that captured people's hearts". In 2003, the Franklin Mint counter-sued; the case was eventually settled in 2004, with the fund agreeing to an out-of-court settlement, which was donated to mutually agreed charitable causes. Today, pursuant to this lawsuit, two California companies continue to sell Diana memorabilia without the need for any permission from Diana's estate: the Franklin Mint and Princess Ring LLC. 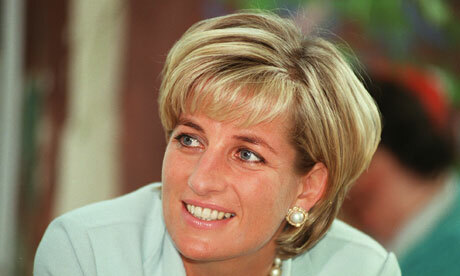 Posthumously, as in life, she is most popularly referred to as "Princess Diana", a title she never held. Still, she is sometimes referred to (according to the tradition of using maiden names after death) in the media as "Lady Diana Spencer", or simply as "Lady Di". After Tony Blair's famous speech she was also often referred to as the People's Princess. Diana's full title, while married, was: Her Royal Highness The Princess Charles Philip Arthur George, Princess of Wales and Countess of Chester, Duchess of Cornwall, Duchess of Rothesay, Countess of Carrick, Baroness of Renfrew, Lady of the Isles, Princess of Scotland. After her divorce and until her death Diana, Princess of Wales continued to be a Princess of the United Kingdom of Great Britain and Northern Ireland without the style Royal Highness. As the mother of the future Sovereign, she was accorded the same precedence she enjoyed whilst being married to The Prince of Wales. This situation made the Princess the first non royal British princess in history. During her marriage, as the wife of the Prince of Wales, Diana used his arms impaled (side by side) with those of her father. After her divorce, she resumed her paternal arms with the addition of a royal coronet. Quarterly 1st and 4th gules three lions passant guardant in pale or armed and langed azure 2nd or a lion rampant gules armed and langued azure within a double tressure flory counterflory of the second 3rd azure a harp or stringed argent overall an escutcheon of Coat of Arms of the Principality of Wales, the whole differenced with a label of three points argent; impaled with a shield quarterly 1st and 4th Argent 2nd and 3rd Gules a fret Or overall a bend Sable charged with three escallops Argent. Prior to marriage, Diana had her own coat of arms, based on a very old coat of arms of the spencer family, which she inherited from her paternal ancestors or father. The Spencer coat of arms came into existence centuries ago. The new arms also applied by her sisters too. The arms showed the coat of arms of the spencer family, the noble family, where they came from. It also included three escallops argent of the Spencer coat of arms. Before her marriage, Diana used the arms of her father. Her previous coat of arms depicted a lozenge shaped shield of arms which hangs from a blue ribbon, this symbolised her unmarried state. This version of the coat of arms only used before her marriage. Diana's interest in supporting and helping young people led to the establishment of the Diana Memorial Award, awarded to youths who have demonstrated the unselfish devotion and commitment to causes advocated by the Princess. In 2002, Diana was ranked 3rd in 100 Greatest Britons poll, outranking The Queen and other British monarchs. On 30 August 2007 Peruvian photographer Mario Testino announced that on 20 November he would auction a signed photo of Diana for the benefit of the Peru earthquake (in London by Phillips de Pury & Co). The photo appeared in a 1997 Vanity Fair issue, and shows Diana wearing a black dress. The Diana, Princess of Wales Memorial Playground was erected in Kensington Gardens at a cost of £1.7 million. The Diana, Princess of Wales Memorial Walk was dedicated to the memory of Diana, Princess of Wales. It stretches between Kensington Gardens, Green Park, Hyde Park and St. James's Park. On 6 July 2004, The Queen officially opened the Diana, Princess of Wales Memorial Fountain. It is located in the south-west corner of Hyde Park in London. In 1999 the Diana, Princess of Wales Memorial Award for Inspirational Young People was established. Diana's family announced in 2010 they would auction art and horse-drawn carriages that once belonged to Althorp House. 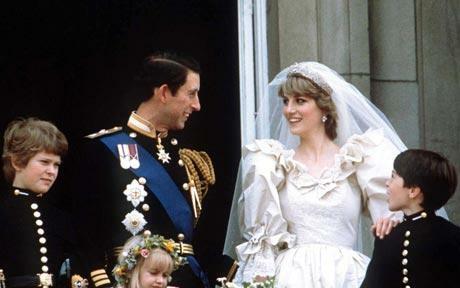 Fashion designers David and Elizabeth Emanuel, responsible for much of Diana's clothes, including her wedding dress, announced in May 2010 they were auctioning 30 lots of clothing, measurements, and related items. Diana by birth was a member of the Spencer family, one of the oldest and most prominent noble families in Britain which currently holds the titles of Duke of Marlborough, Earl Spencer and Viscount Churchill. The Spencers claimed to have descended from a cadet branch of the powerful medieval Despenser family, but its validity is still being questioned. 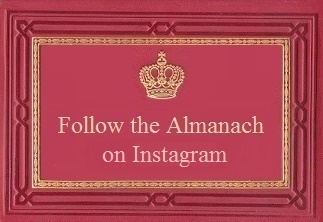 Diana's noble ancestors include the legendary John Churchill, 1st Duke of Marlborough and Prince of Mindelheim, his equally famous wife, the powerful and influential Sarah, Duchess of Marlborough, Britain's first Prime Minister, Robert Walpole, 1st Earl of Orford, Fadrique Álvarez de Toledo, 2nd Duke of Alba, one of the most powerful men of his era, Maria, Duchess of Gloucester and Edinburgh, and Henry Paget, 1st Marquess of Anglesey. She is also a distant relative of the dukes of Abercorn, Bedford, Richmond, Devonshire, Gordon and most of the members of the British aristocracy. Diana's 4th great-grandmother, Eliza Kewark, is often claimed to be Armenian. However, Kewark's exact ancestry is unknown; she is variously described in contemporary documents as "a dark-skinned native woman", "an Armenian woman from Bombay", and "Mrs. Forbesian". Possibly, Kewark was an Indian, and the family deliberately pretended she was Armenian to expunge the "stigma of what was then known as 'coloured blood'." Diana's ancestry also connects her with most of Europe's royal houses. Diana is five times descended from the House of Stuart from Charles II's four illegitimate sons James Scott, 1st Duke of Monmouth, Henry FitzRoy, 1st Duke of Grafton, Charles Beauclerk, 1st Duke of St Albans and Charles Lennox, 1st Duke of Richmond, and from James II's daughter, Henrietta FitzJames, Countess of Newcastle, an ancestry she shares with the current Dukes of Alba. From the House of Stuart, Diana is a descendant of the House of Bourbon from the line Henry IV of France and of the House of Medici from the line of Marie de' Medici. She is also a descendant of powerful Italian noble families such as that of the House of Sforza who ruled as the Dukes of Milan from the line of the legendary Caterina Sforza, Countess of Forlì. Diana is a descendant of the famous Lucrezia Borgia (18 April 1480 - 24 June 1519), who was Princess of Salerno, Duchess of Ferrara, Modena and Reggio. Diana also descends from the House of Wittelsbach via morganatic line from Frederick V, Elector Palatine and of the House of Hanover via Sophia von Platen und Hallermund, Countess of Leinster and Darlington, the illegitimate daughter of Ernest Augustus, Elector of Brunswick-Lüneburg and the half sister of George I. Diana also descends from the House of Toledo of the original dukes of Alba and Medina Sidonia. Diana also descended from ancient noble and royal Gaelic families of Ireland from her mother's side. From her maternal great-great grandfather, Edmond Roche, 1st Baron Fermoy, Diana descends from both the O'Donovan family who ruled the Kingdom of Desmond until the 13th century and became semi-sovereign princes of Carbery from the line of Donal IV O'Donovan, Lord of Clancahill, the De Barry family, an ancient family of Cambro-Norman origins who descends from Rhiwallon ap Cynfyn, a Welsh prince and the O'Shaughnessy family, a family which descends from Guaire Aidne mac Colmáin, King of Connacht.